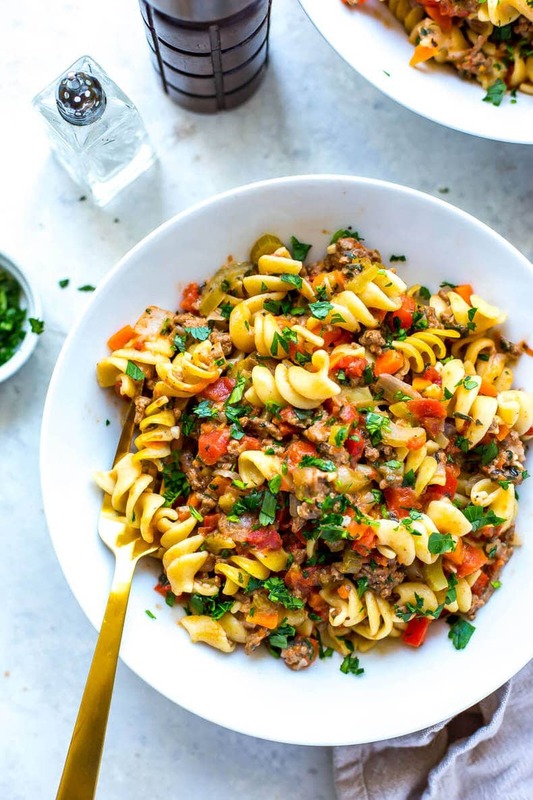 This Healthier Instant Pot Homemade Hamburger Helper is a delicious one-pot spin off on one of your favourite childhood meals, and it's loaded with extra veggies for a well-rounded dinner idea! Make it in the pressure cooker or the stovetop, there are instructions listed for both methods! Stovetop directions: In a large pot, heat olive oil over med-high heat. Add ground beef or chicken, onions and garlic, and cook until browned, about 4-5 min. Add in carrots, celery and red pepper, sauteeing for another 2-3 min. Add broth and tomatoes, along with basil, oregano and salt. Add dry pasta and cover with a lid, cooking on medium heat and stirring occasionally for 12-15 minutes until pasta is completely cooked and most of the liquid is absorbed. Stir in cheese and remove from heat. Top with parsley (optional) and serve! Instant Pot: Add olive oil and ground beef to bottom of Instant Pot and break up meat with a slotted spoon. Add in remaining ingredients in order that they are listed above except for red pepper, cheese and parsley, adding in pasta last. Cook on high pressure for 3 minutes (Instant Pot will take about 15 minutes to preheat then cook the 3 minutes). Do a quick release of the pressure, then stir in red pepper, cheese and parsley. Let sit for 3-5 minutes for red pepper to steam, then serve and enjoy!